She sits upon a throne, noble and confident. Her throne is adorned with mermaids and shells, creatures of the sea. In her hands she carefully holds the cup of visions into which she stares. She is the queen of visions, the queen of intuition. She can foretell the future, and she can understand the language of intuition. As she is queen, and sits upon a throne it is clear that she is an adept, not a novice. She is in command of her gifts, and uses them wisely. When she appears to us, we are gently guided by her to get in touch with our own intuition, to embark upon our own vision quest, and to seek the answers from within. It is believed by some that upon his crucifixion, the pregnant wife of Jesus, Mary Magdalene, escaped persecution by travelling across the oceans to the shores of France, where she became known as Mary of the Sea. She carried with her not only the bloodline of Jesus, but many mysteries that became the vision on which the foundation of several secret societies was based. Also, the legendary tale of the Holy Grail comes to mind, a cup possessing miraculous powers, which according to old Christian lore was the vessel that caught the blood of Christ during his internment. But as the legend of the Holy Grail shows, it is only the spiritually enlightened that eventually discovers that the Grail is not the elusive object that many a king sent subjects out to find in vain, it is in fact closer than imagined. It is the reward of intuition and wisdom within, that has been with mankind from the beginning. For many cultures the sea brings in knowledge, whether it be through new inventions or foreign invasions. 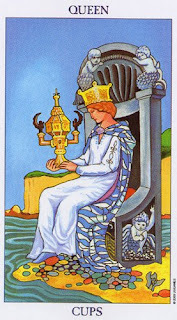 Our queen of Cups is sitting on the beach, intently staring at the cup of visions, maybe the Holy Grail, in her hands which enables her to attain knowledge of the future. When this card appears we might be gently guided to listen to our own intuition, to honour our own visions and dreams, the subtle hints of knowledge that lie deep within. We might ask how do we honour our dreams? One sure way to do this is to keep a dream journal and to record our dreams upon waking, for they will soon fade and disappear into obscurity, forever gone. However, if we record these important visions born of our dream world, we may decipher and discover the knowledge that they carry to us, through the deep and unknown oceans of sleep. Like the Queen of Cups, if we honour the wisdom of our intuition we too will eventually become adept at understanding the symbolic language of visions. We too will be able to seek the council of our intuition, and perhaps in time will develop intuition based wisdom that will reaffirm our connection to Source. We all have within us the power of insight, the power of intuition and the ability to see visions. By developing the ability to listen to our intuition we are all divinely guided into the future. If we take only a moment each morning to tune into our intuition, almost as-if holding a sea-shell to our ear and listening to the sounds of the ocean, we may find that we are a lot more in tune with the ebb and flow of our daily lives. We may find that life holds less unexpected surprises and more subtle hints that steer us along our path to enlightenment and self awareness.